Suskind in the 1981 'Hullabaloo' yearbook. Professor Emeritus Sigmund Suskind, a microbiologist who served as dean of the Krieger School of Arts and Sciences from 1978 to 1983, died Dec. 5 at the age of 80 from cancer complications. A native of New York City who served as a medic in the Navy during World War II, Suskind graduated from New York University in 1948 and worked for two years for the Biology Division of Oak Ridge National Laboratory before entering Yale University, where he received his doctorate in biology in 1954. In 1956, he joined the faculty in the Department of Biology at what was then the McCollum-Pratt Institute of The Johns Hopkins University. He was named professor of biology in 1965 and from 1971 to 1978 served as dean of undergraduate and graduate studies. 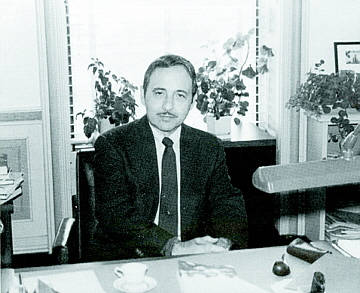 He also was the university's first ombudsman, appointed to that post in 1988 by then President Steven Muller. Suskind taught undergraduate and graduate students in genetics and biochemistry, and published widely in the fields of molecular biology and molecular genetics. Saul Roseman, the Ralph S. O'Connor Professor of Biology, remembers his former colleague as the consummate researcher-teacher. "When I arrived at JHU, I had little knowledge of genetics," Roseman said. "Fortunately, both [Dr. Suskind] and Dr. Philip E. Hartman were down the hall, and convinced me about how important this area would be to our research. So I sat in on the undergraduate genetics course in which they both lectured. Sig was a really dedicated teacher. His method of teaching principles was to present, from the original literature, experiments that attempted to answer specific questions, and from which basic principles were derived. This type of teaching was in the best tradition of JHU, the research university." Allen Shearn, professor and vice chair of the Department of Biology, credits a book co-authored by Suskind and Hartman, Gene Action, with directing his interest toward the study of the roles of genes in development. "I am sure that I was only one of many students of the time who were influenced directly by Gene Action," Shearn said. Gene Action was one of a series of Foundations of Modern Genetics books edited by Suskind and Hartman that Shearn credits with being on the "cutting edge" of the fundamental change that occurred in the field of biology in the 1950s and 1960s. "These books were extremely influential," Shearn said. "Suskind was at the heart of the biochemical revolution that occurred in biology at that time. It was because of his central position that he was able to attract authors for that series of books." Suskind also was a mentor to Ludwig Brand, a professor who arrived at Homewood in the early 1960s. "Sig combined genetics microbiology and biochemistry in unique ways, bringing new insights into life science research," Brand remembered. "He continued to offer important counsel both as dean and even into retirement. He was highly appreciated as a fellow faculty member, dean and as an ombudsman. Sig also was an active sailor and got me and several other members of the faculty interested in sailing the Bay. He will be greatly missed." Suskind retired in 1991 and moved from Mount Washington to Kent County. He is survived by his wife, Ann, and their three sons and two grandchildren. A memorial service was held Dec. 8 at Dulaney Valley Memorial Gardens in Timonium. GO TO DECEMBER 18, 2006 TABLE OF CONTENTS.